The BodyRez certainly adds a sense of resonance to your sound if you're willing to make the investment to help kill that quack. Great build quality. Easy operation. The piezo quack: we all know and dread the sound. That unwanted distortion and plasticky slap that comes from amped-up under-saddle pickups is a long way from the blissful acoustic tone in our heads. External and preamp EQ plays a part in sweetening piezo tone, as do your PA or acoustic amp. Now, TC Electronic's secret weapon: an acoustic pickup enhancer for under-saddle pickups, using preconfigured filters and compression to help restore the sense of 'acoustic' in your electro sound. Plugging straight into a PA and starting with this mini pedal's sole Body control at 25 per cent to A/B test, we immediately notice a subtle compression, boost in the low-end, and a cleaning up of our sound across the frequency board. The further you turn that knob, the more pronounced the low-end gets. For anyone playing in a band setup, this is where you need to play a balancing act: a rich boominess can get lost in the monitor mix. Solo players and recordists will have more leeway. This isn't meant as a do-it-all preamp, more a simple fix that could be especially useful at your next open mic. 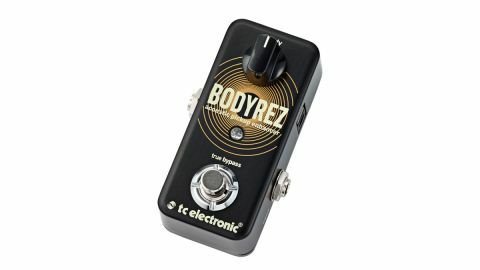 We'd have settled for a larger pedal if it meant battery power for grab-and-go gigs, but the BodyRez certainly adds a sense of resonance to your sound if you're willing to make the investment to help kill that quack.